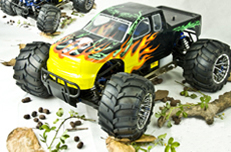 This 1/10 scale 4WD nitro gas powered on-road touring car is of single speed transmission. Other than same scale hobbies, on-road touring cars would never fail to run faster on flat surfaces than other hobbies cars do. All on-road touring cars are built in low chassis design and provides aligned running in line. 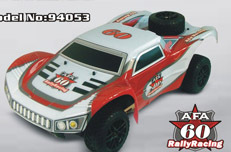 This 1/10 scale 4WD nitro gas powered on-road touring car is of two speed transmission. 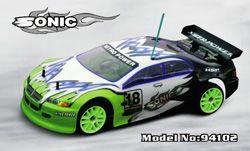 Other than the same scale hobbies, on-road touring cars would never fail to run faster on flat surfaces than other hobbies cars do. All on-road touring cars are built in low chassis design and provides aligned running in line. Pivot ball suspension vehicles embody more skillful steering response. 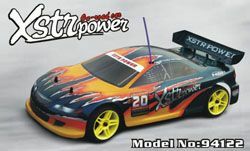 This 1/10 scale 4WD nitro gas powered on-road touring car is of the one of pivot ball suspension. 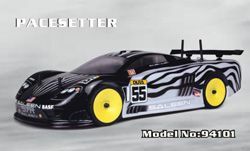 On the other hand, unlike the same scale hobbies, on-road touring cars would never fail to run faster on flat surfaces than other hobbies cars do. All on-road touring cars are built in low chassis design and provides aligned running in line.